EU MPs urge Catherine Ashton to rescind proposed ban on trade with Israeli entities in Judea and Samaria, set for Jan 2014. 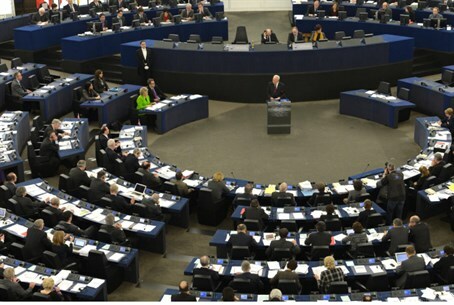 At least 30 members of the European Parliament urged the EU Wednesday to rethink July guidelines banning financial ties with Israel over building in Judea and Samaria. reverse or at least soften the guidelines setting a January 2014 ban on funding and business deals with establishments in Jewish regions of Judea and Samaria and Jerusalem. They urged Ashton "to take all the necessary steps to withdraw the commission guidelines or, at the very least, to come to terms with the government of Israel to ensure that their implementation will reflect the deep bilateral relations between the European Union and Israel and would by no means harm them." An appeal to the EU ban was declared shortly after the announcement on legal grounds. The missive was led by former Israeli Ambassador to Canada Alan Baker, who now serves as head of the International Action Division at the Legal Forum for the Land of Israel, and included former Justice Minister Yaakov Ne'eman, as well as top international law experts Professor Eliav Shochetman and Professor Talia Einhorn. The appeal urged the European Commission to rescind its directive, arguing it is "based on misguided and legally flawed assumptions about the status of the Israeli settlements and the validity of the 1967 lines as Israel's borders." Baker has previously argued that Israeli communities in Judea and Samaria are in fact legal according to international law, despite claims to the contrary. He recently slammed US Secretary of State John Kerry's categorization of Jewish communities in Judea and Samaria as "illegitimate", as "a factual and legal mistake." Israel warned in August that it might refuse to participate in Horizon 2020, a seven-year 70-billion-euro ($94 billion) research and innovation plan, in response to the impending EU boycott. Israel had originally been planning to contribute 600 million euros to the project, which it retracted after the ban was issued last summer.